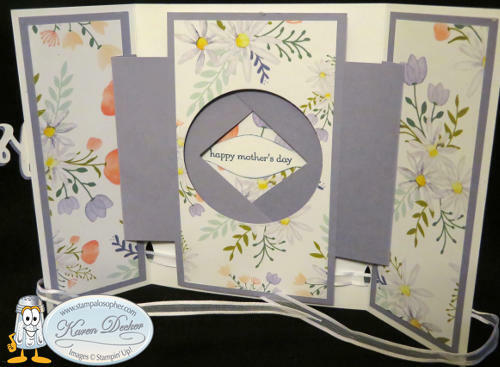 By Karen Decker in All Occasion, Easter, Fancy Fold, Mother's Day on April 6, 2018 . My Easter card this year was the Magic Shutter Card. There are many videos on pinterest by that name, though I found if I prop my smart phone up on a stand, I can scroll through the dimensions on a written post like this one as I construct the card. Then there is no stopping and starting a video and trying to take notes, just tap the screen and scroll to the next step. Do you like doing that? 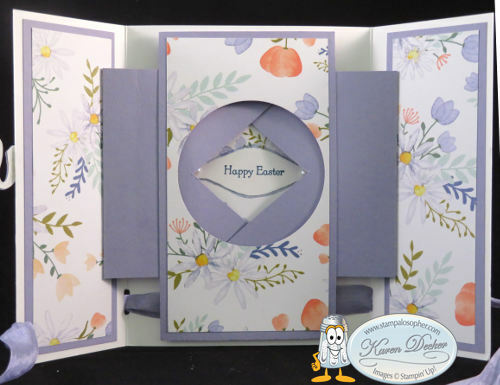 The Delightful Daisy Designer Series Paper (#144137) matched with Wisteria Wonder card stock (#122922) does all the work of making the card beautiful. As you open the card the shutters open like the shutters on a camera for a great “ooooo….” moment. One designer put a picture of her child behind the shutters. With Teeny Tiny Wishes (#127802) this card could say Happy Mother’s Day or Happy Graduation or any of the other tiny wishes. 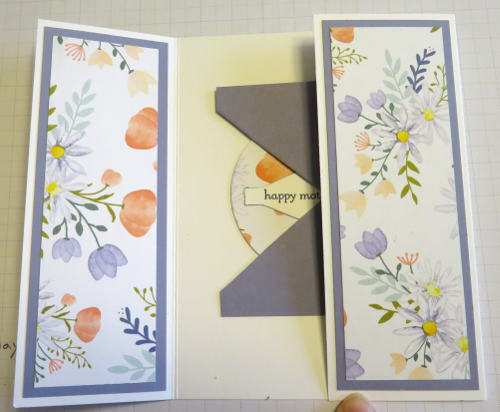 The base is Thick Whisper White cardstock cut at 8 1/2″ X 5 1/2″ and scored at 2 1/8″ and 6 3/8″ Tip: After scoring the card base, gently fold the scores bringing the two sides to the middle to exactly match and then hold them in place and use your bone folder to firmly burnish the score lines. Attach the DSP to the Wisteria Wonder layer and then attach each to the base. Now let’s make the inside middle panel but it won’t be attached until after the shutters are attached. Attach the DSP to the Wisteria Wonder. The circle in the middle is cut out with a 2 1/2″ layering circle framelit (# 141705) or the retired 2 1/2″ punch. Cut your circle out just slightly above middle. Tip: If you are using a punch, punch out a template on a sticky note and put it on your card panel to guide where you punch. Come down from the Wisteria Wonder top 1 1/4″ which will give you 1 1/2″ at the bottom of the circle cut out. 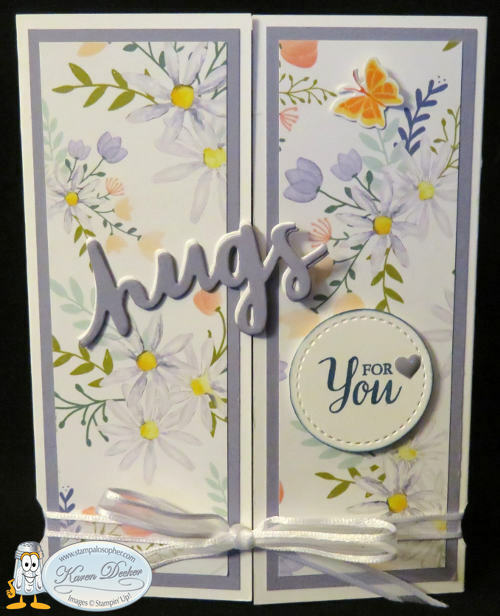 Stamp the greeting on a Whisper White Strip 3 1/2″ X 1″ and punch it out with the Bow Builder punch (#137414). Attach it to the center of the circle cut out. The cut out will show behind the shutters so choose what you want to show, or match, as you glue on the greeting. 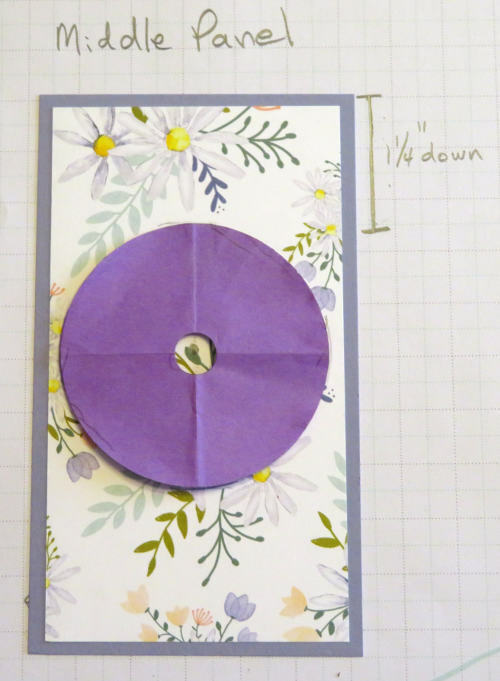 Draw around the greeting with a Wisteria Wonder marker or sponge the greeting edges before gluing to the circle cut out. You are not going to attach the middle panel yet, but you need to use it to guide where you glue the circle cut out. 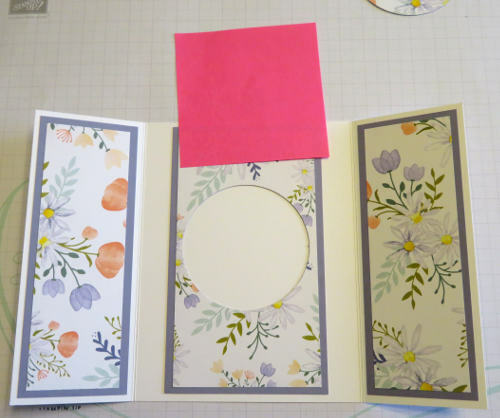 Hold the panel in place with a sticky note, put glue on the back of your circle cut out with the greeting, and carefully press your circle directly through the opening. Put the panel aside as you make the shutters. Clip the pointy ends off the shutters. Score the uncut side at 1/2″. 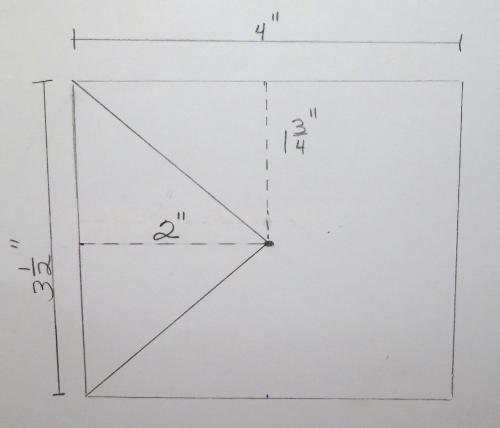 Fold your score line and burnish well then unfold it and place the shutter right along the edge of the fold on the base. Put a piece of sticky tape on the 1/2″ edge. Remove the sticky tape cover and then fold the side over pressing it onto the sticky tape. Repeat on the other side. Layer the shutter’s points with one point on top of the other shutter and one point below. Most of the cards online use a belly band but I prefer a ribbon that stays attached. I used the retired ribbon punch and punched the edge of the fold on each side. The Pretty Label punch (#143715) would work almost as well. Close each side and punch a little slot in the Whisper White base. 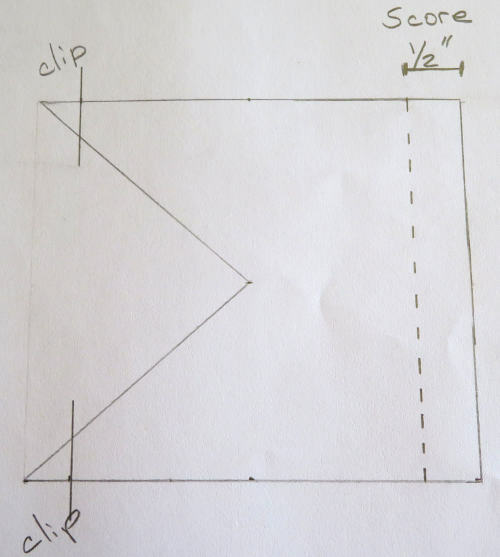 I marked 1/2″ up from the bottom with a pencil so both sides would be in line. After the inside was done, I put pearls on each end and tested to see if they would interfere with the shutters. They didn’t –so it worked! The “Celebrate” thinlit was a Sale A Bration free product that will be available in the new catalog June 1st! Three “celebrates” were cut out – two with Wisteria Wonder 3″ X 4 1/4″ and one with Thick Whisper White 1 1/2″ X 4 1/4″. The purples were glued on top of each other and the white was offset a little. I used Tombow liquid glue and drew a thin line of glue on the letters – counted to twenty to let it get tacky- and then glued it on. If you wait just those twenty seconds the glue won’t gush out on your project. The butterfly is stamped with the “You Move Me” stamps (#144002) and cut out with the “Move Me Thinlits” (#143732). 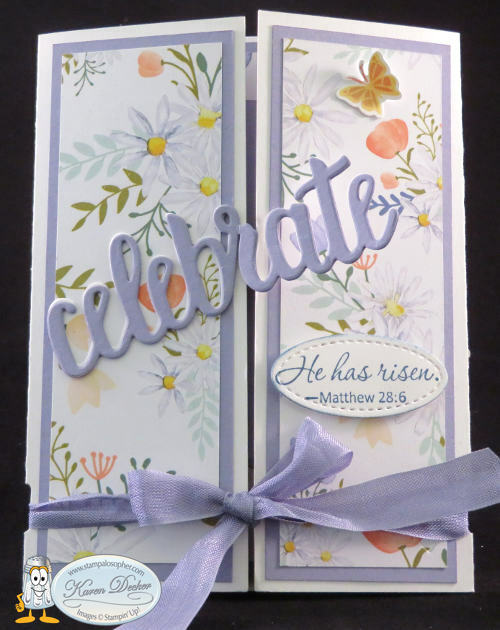 Whisper White 1 1/2″ X 3 1/2″ will do both the butterfly and the He Has Risen greeting. Stamp the butterfly first with the solid stamp in Crushed Curry and then stamp the wing detail in Tangerine Tango. 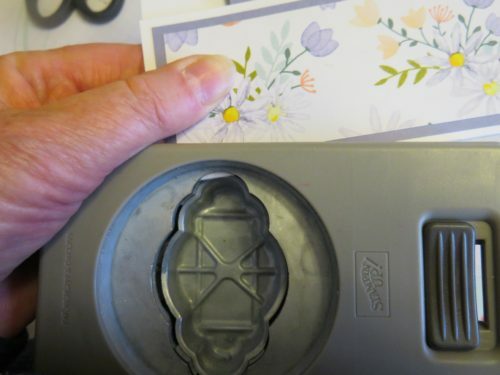 (I love two step stamping sets, and the butterfly thinlits even have antennae!) I used a Tangerine Tango marker to draw a thin line on the antennae then attached the little beauty with a glue dot under one wing. The greeting is from the retired “Easter Message” stamp set and cut with a Stitched Shape Framelit (#145372). 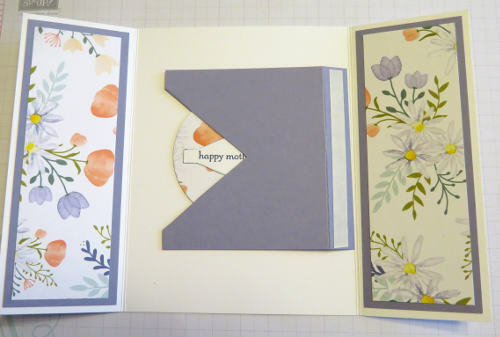 My Mother’s Day card uses the current Lovely Words Thinlits (#143733) and the Whisper White 1/4″ Organza Ribbon from the Occasions Catalog Page 23 (#145590). The “For You” greeting is from the So Many Shells stamp set (#143695). The little heart is from the Subtles Enamel Shapes (#141679). After I had taken pictures I added another heart on the greeting and one down in the bottom left. What do you think? The Delightful Daisy Designer Series Paper (#144137) will be retired after May 31 and the retired list comes out on April 9 so it will only be available while supplies last. Click on the little SAL computer image to order this or any other products!